With our high speed digital printers we can reproduce your documents in color or B&W. 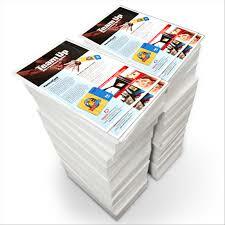 We can print on wide selection of paper stocks including glossy paper and heavy card stock. 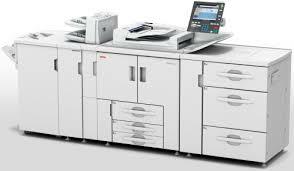 Our copy department features the latest high speed Ricoh digital printers. Your documents are printed with vibrant colors and exceptional image quality. Today’s digital color printers provide high quality prints that rival that of traditional offset printing. Digital color printing is a perfect choice when you need smaller quantities of printed items such as brochures, flyers, postcards, newsletters or invitations just to name a few. We use state of the art production machines that allow us to print you jobs fast at prices other print shops just can’t match. Contact us today and let us show you how we can get your project done on time and on budget. We also feature high production digital B&W printers for your projects that do not require color. For certain products such as documents used for internal communications within your company, this option can be a very cost effective method of meeting your communicating needs. Some of the items that may be suited for type of printing would be employment applications, memo pads, new customer information forms or any other item where basic black and white printing is all that is required. Contact us today for a quote on all your document reproduction needs.